It is that time of year. When I start to think about chickens. I think that we are about ready to take the plunge into chicken ownership. I have been reading book upon book about chickens. How to raise baby chicks. How to build a coop. What breeds are great egg layers. Which ones will attack you when you aren’t looking 🙂 My favorite book right now is Keep Chickens! Tending Small Flocks in Cities, Suburbs, and Other Small Spaces. It seems to have a good amount of information in it, all of what I need to know. It has all been a lot of information to take in of course, but I think I am ready. They are great layers. Have a friendly disposition. And are hardy in cold weather. What appealed to me about this breed is that it has a friendly disposition, and of course the fact that they are cold hardy. Since I have young kids, I want chickens that will behave and be nice. I am hoping that raising them from chicks will help that. The fact that they will be around the kids from the beginning should help. At least that is my hope! They are also great layers. Are friendly, yet curious. Again, I was looking for great layers. While I eat a mainly vegan diet, the rest of my family tends to enjoy eggs (and I like them as well). I want to have chickens that lay a lot of eggs. I am hoping that we will be able to sell some of the extra eggs to some friends, hopefully making our chickens and eggs pretty much free. These chickens are good layers, and they are cautious. Technically we are only allowed six hens. But, I am thinking of getting many more than that, maybe 18. I know that we will probably lose a couple, and I would prefer to have enough at the end of the day, rather than too few. We live in an area that I doubt will be checked on, and even if we did get in trouble, since my mom lives down the road we could easily put half down there and be fine I am sure. Hopefully we won’t lose any though. It would be a much better situation not to have to explain to Emma that we have lost a baby chick. Although, that is life with farm animals, and I am sure she would take it well. So, it will be happening soon, probably this week. Hopefully this means that I will be getting eggs in the fall, although I am not entirely sure how that all works. I know it usually takes 6 months or so before you start getting eggs, but since this will be in the fall, with a lot less light, I am not sure they will continue to lay or not. Any ideas on this? Should I keep light in their coop? Should I let them have a natural cycle and not have the light? Does it matter? We are also considering meat chickens. I think Matt would be very happy to have a roast chicken every week or so…those would definitely have to be at my mom’s. Exciting times here! If you live in Maine, you must provide heat to the birds. 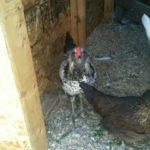 We live in Michigan and use 2 infa red light bulbs drug out to the coop with an extension cord. It doesn't get much cheaper than that 🙂 Also don't forget that you must keep their water in liquid form. Without a heat source the water will freeze. They must have constant access to fresh water. That is even more important to egg production than food. In addition to the heat lamps, we have a full spectrum light bulb on a timer. The full spectrum light bulb has every color that the sun does, and we have never had even the slightest slow down in egg production in the winter. We provide the chickens with 14-16 hours of this 'sunlight" and then the timer automatically turns the bulb off and they jump up to roost and go to sleep. I second the motion that 18 birds is too many to start with. If you are going with a heritage breed bird, not one of those hybrid Franken-birds, you will probably end up with 18 laying hens. Thats 12-15 eggs per day. Maybe start with 8-10 and if you love doing it and are enjoying yourself, than the next spring get 8-10 more! I would also recommend that you research chicken feed suppliers and find one that sells organic soy-free chicken feed, that is not laced with a bunch of GMO grain, herbicides, pesticides, growth hormones, and antibiotics. Great luck to you, it sounds like a grand adventure. You are so lucky to live in a city that allows chickens. There are so many here in Michigan that are banning the practice. We absolutely love them, and their individual personalities. 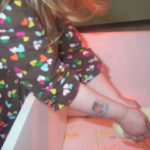 We handled our chicks a lot from the moment they arrived, and they are very friendly. Believe it or not chickens recognize different peoples faces and will come to know you and your voice. The more they are handled and imprint to you and the kids, the easier they will be to handle. Of the breeds you mentioned, I would suggest the Buff Orpington. They are very "mellow" and easy with small children. I definitely encourage you to take the plunge! Getting chickens is scary, but overall they are far easier than you expect them to be, provided you give them what they need… which isn't much- Wholesome food, housing (which they're pretty flexible about really), and a little place to scratch, and they're happy. I started with the exact same breeds you listed, and they are good ones… BUT this year I'm getting into heritage breeds. They are harder to find, but so far I'm really happy with them. I got Buckeyes from a local breeder I met through Backyard Chickens (which you should join if you haven't already!) and they are super friendly. So far as laying, I live in Minnesota (less than 10 hours of sunlight for much of the winter) and didn't use any supplemental lighting in my coop other than red heat lamps ONLY when it was super cold, and I had eggs all winter. BUT I have 18 hens and at their lowest I was only getting 7-8 eggs, so out of fewer hens you might only be getting 2-3 eggs a day. That was only for about a month, though, then the rate went up. Usually hens will lay regularly over their first winter, then stop to molt their second winter. Also, I don't think it's large breeds that take that long to lay, but non layer hybrids. I have six red stars who started laying in about 16 weeks, while my standard breeds (the same breeds you have above) took about 20 weeks. Most won't take six months, but they could. So if you get them this week they should start laying by the end of July or beginning of August, long before the days start to shorten. Good luck! Getting chickens has been one of the most fulfilling things I have ever done, and it is SO much easier than pretty much any pet I've ever had, other than possibly outdoor cats. Plus they more than earn their keep by giving us delicious healthy eggs, eating scraps, turning my compost, reducing the bug populations, cleaning up the garden, and creating fantastic fertilizer! Wow! Thanks for all the great info! I am slightly concerned about what to do with them in the winter. We live in Maine, and it gets quite cold. I am not sure we will be able to get electricity to where they are. I haven't entirely figured out that whole bit…any ideas besides a heat lamp? Raising chickens will be fun. We have raise chickens for almost 20 years. We don't have any this year and we miss them. My teenage son eats 3 to 4 eggs a day. We miss the orange yolks too. The Easter egg chickens were fun. One year someone was moving and asked us if we would like to have 3 of those chickens. My daughter was in 4-H and so we raise many different kinds of chickens… even bantams. Let us know which chicks you pick… they are fun to watch grow. smile. Congratulations on embarking on your new chicken adventure! Our May 1st Easter Egger (hatchery Amercauna)didn't start laying until January. Just an fyi. It really depends on the chicken. I also love our Orpington who was hatched first week in September. Very sweet, curious, and friendly. Good Luck! Hi Heather! My name is Anne and I just found your blog. It looks awesome and I can't wait to go exploring. I just got chickens myself for the first time last year and they're doing great: haven't lost one! Love for you to pop on over to my blog Life on the Funny Farm sometime and say hi. I'm at http://annesfunnyfarm.blogspot.com. Thanks for visiting Anne! I can't wait to see your chicken adventures! Yay! Chickens – I know the kids will be such good little workers. Next up…bees! There are a lot of blogs out there devoted to chicken keeping. Here is one: http://eggcartonlabels.blogspot.com/ She probably has a list on her blogs of the ones she follows. Go from there. I have 15 and one rooster. We raised 7 from week old chicks, bought 7 layers and one hen went broodie and we got two hens from her. It's fun, rewarding, entertaining and delisious (eggs that is). Have fun. Ah, chickens. I'm so jealous. I know my turn will come, though. I'm not ready for them right now. I'm going to put that book on my to-read list. I want to get chickens this year too. I have a tiny yard but I need to find a way to squeeze them in somehow. After I finish making all my frames for the bees, it's next stop chickens. This post is very helpful. Thanks for writing it. We've had chickens for about six years, and it was that same book that got me started on our chicken-keeping adventure ;). In answer to your question, if you get chicks now, you will have eggs in the fall. Larger breeds (in my experience) take longer to start laying. So, of the breeds you listed above, you'll probably get the green or blue eggs first. 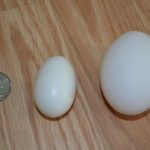 Once they start to lay, you'll probably get an egg every thirty-six to forty-eight hours per chicken until mid-December, and then, depending on how you build their coop, they may stop laying for a period of time. We do not keep a light in our coop, but designed our coop with a clear roof on the south-facing side of our property so that our chickens get natural daylight all year round. We get eggs, sporadically, year-round, and anecdotally, our chickens, with no artificial light, lay as well as our friends who have lighted coops, with a solid roof. We also raise meat chickens. We have a quarter of an acre. We keep them inside in a brooder for two to three weeks, and then, when they've feathered out, we put them outside in a "tractor." We take them to our butcher at eight weeks. We'll raise around fifty chickens, with a new dozen chicks arriving every four weeks or so during the summer. In the three or four years that we've been raising meat birds, we've lost two – both to heat and both last year. Until then, we'd had a 100% success rate from breeder to butcher with our meat birds. By the way, eighteen chickens is a lot of eggs. During the summer, EACH chicken will lay every twenty-four to thirty-six hours or so – some more frequently depending on the breed and the age of the hen (we have a six year old hen still who lays every two to three days), which means you'll be getting, at least, a dozen eggs a DAY, that's seven DOZEN eggs a week – which is a LOT of eggs. We have eight hens – all of whom are over two years old, and we're getting about two dozen eggs per week. You'll enjoy having so many eggs, at first, but it can get overwhelming very quickly – even if you have people (like your mother), who want eggs, it can still be a lot to deal with. You mention that you're concerned about losing a few. We buy our chicks from a local farm store, but they get them shipped from a breeder. We've had a 100% success rate from brooder to outdoor coop, and we've never lost a pullet to disease. In fact, the only time we've lost young hens is when a raccoon got into the coop. So, from my experience, if you start with 18 chicks, you'll end up with 18 hens. Ten might be a better start. As long as you keep them in a clean, warm, and dry place with plenty of access to good food and clean water, they'll survive. And they'll reward you for your efforts :). Very exciting times, indeed! We love our chickens! Thank you for all the tips Wendy! I'm sure 18 chickens would produce quite a few eggs…maybe we should start with fewer. But, we do go through 3-4 dozen eggs per week. A lot I know 🙂 I was figuring on losing some though, so maybe I won't start out as high since you seem to have such a good outcome. I agree 18 chicken is alot… not only the egg production, but the maintenance… 18 chickens make a lot of poop and pee… we have 5 chickens that I raised from babies, and they are wonderful little pets as well as giving me 5 eggs a day… some are even big double yolks… we also raised 25 meat chickens and lost 2 due to dehydration… but the rest are nestled safely in my freezer 🙂 Enjoy your chicken adventures!! I grew up with tons of chickens. I never had chicken from the store until I was in the double digits. I would definitely have meat chickens, but I wonder if I could kill them. I witnessed it quite a few times, but I am not sure…. I think about having them from time to time, but my husband says no way. Maybe one day he will change his mind.